4-18. Acclimatization, climbing (15 days). 3-17. Acclimatization, climbing (15 days). Note: Duration of program can be changed by request. Transfer / flight from Almaty to Bishkek and Osh. Note: Kyrgyz Airlines reserves the right to change air fare without prior notice. Note: Prices for Hotels 2*, 4*, 5*, Guest Houses and Apartments are available by request. 1. Prices are valid for groups booked and paid 8 weeks before arrival or earlier In case of late booking and payment (less than 8 weeks) extra charge for formalities 70 US$ per person is charged. 2. For individuals and groups up to 4 climbers shared transport from Osh to Base Camp and from Base Camp to Osh will be provided, day of transfer is floating. Departure schedule of transfers to join should be reconfirmed with ITMC in advance. In rare cases for those who book arrival before July 15 or departure after August 20 an extra day in Osh or in Base Camp may be required. 3. Climbers provide personal mountaineering gear for ascent and choose tactics for ascent by themselves. 4. Kyrgyz Airlines operating domestic flights Bishkek-Osh reserves right to change air fare without prior notice. 5. On domestic flights baggage allowance is 15 kg per person, overweight is charged at 1 US$ / kg. 6. If expedition group prefers to send mountaineering gear/outfit to Bishkek or Osh in advance, ITMC can arrange customs clearance and provide delivery to Osh. 7. Climbers must have medical insurance with a minimum coverage of 40 000 US$. From Achik-Tash Base Camp (3700m) walk through the glade of Lukovaya Polyana (“wild onion meadow”). As the plateau ends follow the small steep path that ascends towards Puteshestvennikov Pass (4100m). Descend again via the moraine to the right where the climb up Lenin Glacier begins (about 5 km from Base Camp). Walk along the Glacier further for 5 km to the altitude of 4200m where Advanced Base Camp is located on the moraine near the head of glacier. Approximate time from Base Camp to Advanced Base Camp is 6-8 hours of hiking. From Camp 1 (Advanced Base Camp, 4200m) cross the flat glacier again and go right up the face to the "Skovorodka" (“frypan”). This area is heavily crevassed and it is highly recommended to use ropes and move together in roped climbing teams of at least 2, but preferably 3 climbers. Relatively steep (45º+) part of snow or ice between camps 1 and 2 are protected by fixed ropes. But be aware that in some parts ice screws are prone to melting out in the midday heat. 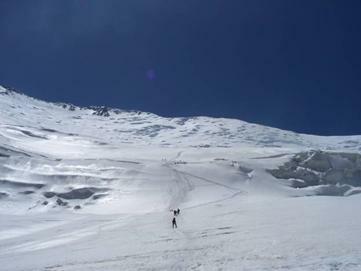 At the top of the steep section begins the traverse to Camp 2, which is located on a rocky section to the far right of the glacier at about 5300m. Approximate ascent time from ABC at 4200m to Camp 2 at 5300m is 6-8 hours. This section can be exhausting in sunny weather due to the heat. From Camp 2 at 5300m ascend steeply above the camp to gain the ridge. Follow the ridge up to an altitude of 6100 m where Camp 3 can be set up on the small col under Mt Razdelnaya at an altitude of about 6100m. 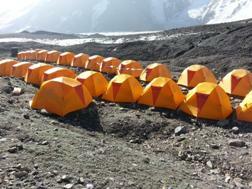 Approximate ascent time from Camp 2 to Camp 3 is 4-6 hours. This part of the ascent is a snow slog with few crevasses where rope and harness are not usually necessary. It is possible to camp along the ridge in case of bad weather or emergency. From Camp 3 at 6100m ascend along the western ridge of Peak Lenin. The first part of this ridge can be mixed snow and rock. 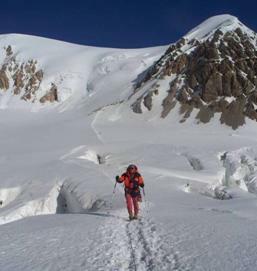 A rocky plateau is reached at 6400 m (where it is possible to establish Camp 4 if required). Above this plateau is a short steepest snow slope of about 40 degrees where there is often a fixed rope and an ice axe may be necessary, care should be taken on this short section, particularly on the descent. Above this there is a rocky section before reaching the pre summit plateau which at first drops then rises to the true summit plateau at 7134m. 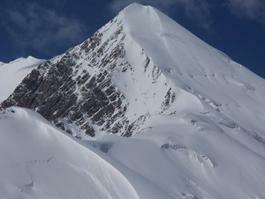 Approximate time from Camp 3 to summit and return is 10-15 hours. The whole route to the summit can be subject to extremely high winds which can also be incredibly cold. High altitude mountaineering boots (for up to -30C), hiking boots, snow gaiters, crampons, baselayer, down jacket, windproof & waterproof jacket with hood, warm & waterproof gloves or mitts, mountaineering or climbing harness, climbing helmet, karabiners (2 x screwgate), prussic loops x 2 (5m / 16ft of 6mm cord), rope, ice axe (light, not technical), sleeping bag (up to -25C), thermarest or similar sleeping mat, high altitude tent, rucksack (40 l minimum), head-torch, sunglasses, trekking poles, gas-stove and kitchen/dining set, medical aid kit. 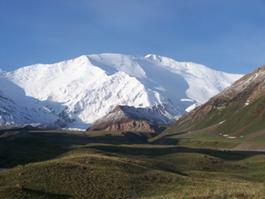 The northernmost of Pamir's ranges is the Zaalai range, rising as a gigantic wall over the Alai valley. The central part of the Zaalai range is the highest and the most monolithic. Its length is 92km and its average height is about 6,000m. 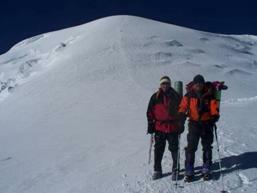 There are many peaks of more then 6,000m, the highest point being Lenin peak (7,134m). 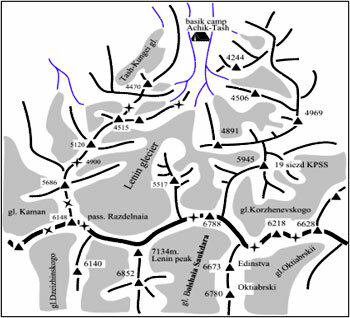 The largest glaciers of the Zaalai range are the Lenin, Korzhenevskogo, Oktyabrsky, Big Sauk-Dara, and Small Sauk-Dara glaciers, tumbling down from Lenin peak; the total area of these glaciers is about 800 sq km. The southern slope is sheer and rocky. Its valleys hang over the Muksuu River. It is an extremely inaccessible region. The northern slope facing the Alai valleys is wide and gently sloping, there are neither deep valleys nor high spurs. This easily accessible region can be reached by highway. The length of Lenin glacier is 13.5km; its area is 55.3 sq km. It is the largest hollow glacier of the northern Zaalai slopes. The surface of the glacier is clear, with a few crevasses. The Base Camp "Achik-Tash" (3,600m) is located at the bottom of Lenin glacier on the Achik-Tash plateau, surrounded by blue lakes. 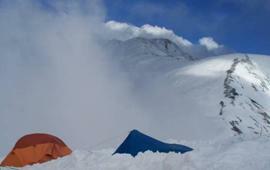 The comfortable location of the camp and warm weather conditions allow fro a nice break after difficult ascents. Easy approaches to the summit areas allow mountaineers to achieve good acclimatization for the ascent to Lenin Peak. 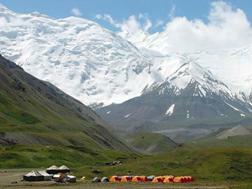 Climate conditions in the Base Camp area are milder than in other regions of the Pamir. The average temperature in July is +100C. The slopes of Lenin Peak are snow and ice fields. There are no sheer cliffs and slopes, which allows for ascents without complicated mountaineering techniques.